The U.S. Constitution provided a unique solution to despotic and tyrannical governments. For the first time a judicial system was incorporated, that would interpret, pronounce and execute laws independent from the elected leadership. The rights of individuals established in the Bill of Rights would be protected from future abuses. The Constitution established "one supreme court and ...such inferior courts as Congress may from time to time ordain and establish." The Supreme Court was, except for some few instances, to have appellate jurisdiction only. That is, they would only hear appeals of cases that had been decided in a lower court. However, in all cases affecting ambassadors, other public ministers and consuls, or those in, which a state is itself a party, the Supreme Court would have original jurisdiction; they would be the first court to hear and decide the case. Neither the size of the court or, the qualifications for the justices is addressed in the Constitution. Their independence, though, is secured by a provision which states they "shall hold their offices during good Behavior and shall, at stated Times, receive for their Services a Compensation which shall not be diminished during their Continuance in Office." The Supreme Court was not held in very high esteem in the beginning. All the original appointees were Federalists who were sympathetic to the administration. 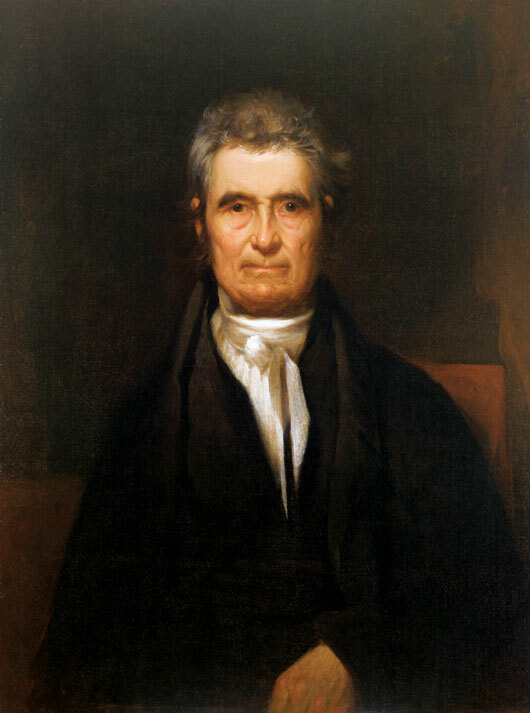 It wasn't until John Marshall of Virginia was appointed in 1801 that the character of the Supreme Court was truly established. Marshall's greatest victory was Marbury v. Madison in 1803, which held that the Supreme Court could declare acts of Congress unconstitutional. Following Marshall as chief justice was Roger B. Taney, who served from 1836-1864. Taney's most famous decision, and the Supreme Court's biggest embarrassment was Dred Scott v. Sanford (1857) in which the court, thinking it could solve the slavery problem, decided that blacks could not be citizens, and Congress could not control slavery in the territories. Because of this decision, the court was so severely compromised that it could not constitutionally challenge any of President Lincoln's actions during the Civil War. Following the war between the states, the Supreme Court was in disarray. Congress even changed the size of the court three times in seven years for political reasons. Eventually, the court, under pressure, began rebuilding itself. There was no chief justice of, Marshall's stature. Instead, the associate justices became the guiding force. By the 1900's, the Supreme Court was firmly established as one favoring the free enterprise system with little or no government interference. They invalidated New York's 10-hour law for bakers, held the Child Labor Act unconstitutional, and overturned the District of Columbia's minimum wage for women. 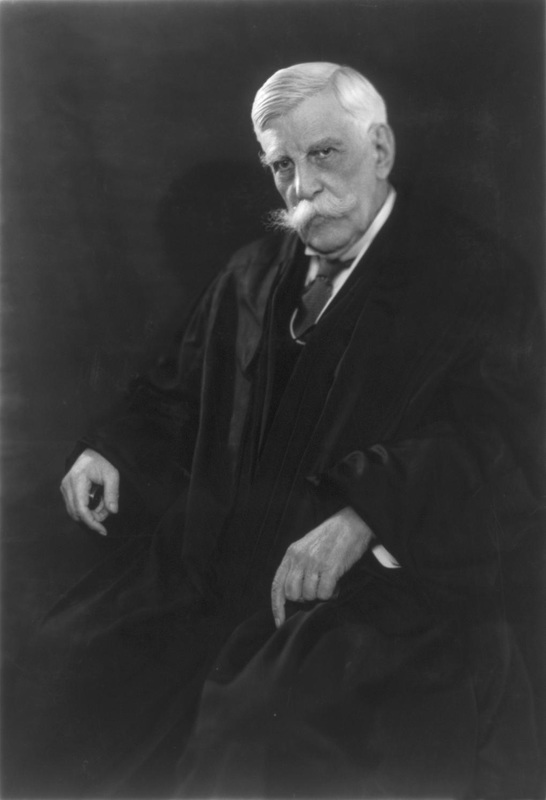 In 1902, President Theodore Roosevelt appointed Oliver Wendell Holmes to the court as an associate justice. He served for 31 years and resigned at the age of 91. A liberal on court that was predominantly conservative, he became famous for his dissents, in which he protested against the denials of civil liberties and the reversals of progressive legislation Holmes was joined by Louis D. Brandeis in 1912 in dissenting Supreme Court decisions. While the court stayed predominantly conservative, the intervening years saw more liberals joining the ranks. Franklin D. Roosevelt had the opportunity to appoint eight members to the court during his presidency. While the court had begun to shift its emphasis towards civil liberties, the court under President Truman turned a blind eye to the hunting of communists by Senator Joseph McCarthy. In 1853, Earl Warren was named chief justice. His court faced the most controversial issues in American history. It began with Brown v. Board of Education in 1954. That decision declared racial segregation unconstitutional. Another landmark decision was Miranda v. Arizona (1966), in which suspects under police inquiry must be notified of their rights, including the right to council, or confessions are invalid. Congressional conservatives even attempted to initiate measures that would curb the Warren court or reverse some of its decisions. The measures were only narrowly defeated. In 1969, Earl Warren was replaced by Warren E. Burger, a conservative who had been outspoken in his opposition of the decisions made by the Warren court. While more conservative on criminal law reforms, the Supreme Court under Burger overturned more acts of Congress on First Amendment and equal protection grounds than all previous courts combined. The current Supreme Court is headed by William Rehnquist, who took office in 1986. His court has seen the first female associate justice. They have also recently faced several emotionally charged issues, namely abortion rights and flag burning. Throughout its history the Supreme Court has sought to further define the limits of individual rights as well as those of business and government. The court is often a reflection of the prevailing attitudes of their times. While emphasis may sway one way or another, always behind those decisions are the guidelines of the Constitution which they have sworn allegiance to.